Roksan returns with redesigned Radius 7 turntable | What Hi-Fi? 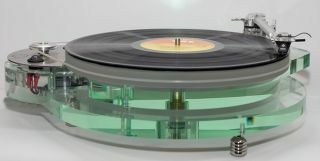 The 7 is the latest version of Roksan’s Radius turntable line and comes packing new technologies and an updated design. The Roksan Radius turntable line was launched in 1989, originally as a budget deck, but has developed over the years to become a more premium turntable. This latest version uses a decoupled dual-layer perspex plinth in a newly designed "glass-effect" finish. The shape of the plinth has remained the same since the original, with Roksan saying it’s now better able to control unwanted vibrations. Roksan says it has redesigned the decoupled motor in the Radius 7 from scratch, while also borrowing speed control technology from the company’s flagship £6,000+ Xerxes turntable. The acrylic platter is the same as the one found on the Radius 5.2, which won a What Hi-Fi? Award back in 2010, while the Radius 7 comes with its own Nima tonearm. The Nima uses a uni-pivot design and has the same internal wiring as the flagship Artemiz tonearm. The Roksan Radius 7 will ship in the UK from March for £1900. Visitors to this weekend's Bristol Show will be able to have a listen in room 416.